to find out if anyone was heading one up. Here is what I found, there is a 7th grade boy in the Grand Rapids Michigan area heading up a bear drive. I've been asking if there are any volunteer bears around here who'd like to relocate to Haiti, to be a comfort to a child. Jeffery, Tigg, Barnes helped me spread the word. The bears that want to go have been gathering in the living room for a couple of days. We were amazed at the number of them. There are a lot of small bears and a few medium to large size. Some of them are from the influx we received back in September's Bear Migration, some have been in deep hi-bearnation for awhile. After a few of them got new bows, and some others gave up their sweaters. One of them gave Barnes his Teddy sweater, after all it will be too hot in Haiti for sweaters. There were 2 or 3, I couldn't convince of the temperature difference. We all gathered together again. I talked to them about the new adventure and mission they were embarking on. Then read them one of my favorite quotes from my The Quotable Teddy Bear book to them. 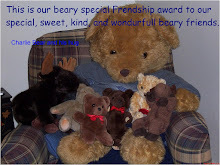 We will be sending our gathering of bears to Michigan and from there they will travel to Haiti. One of my mom's friends has agreed to transport the bears to Michigan the end of next week. If you want to participate in Blare's Teddy Bear's for Haiti - The collection deadline is March 15th, 2010. The Bears can be dropped off or I imagine mailed to the addresses found here. If you don't want to donate bears, perhaps you'd like to contribute to one of my favorite chairities. Feed My Starving Children. They package complete meals for just .17 per meal - only 6% of your donation goes to overhead administration costs. 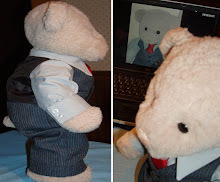 What a great idea to send bears to Haiti!!! I hope the children feel better when they have a bear friend!